The Indicator Light (pictured above in green) is a product that informs the vehicle operator that the tailgate or cargo door is open. The unit has a light in a dash mount that comes on if the tailgate or cargo door is open. Once closed the light goes off. The unit also has an option to turn it off if the operator so wishes, as to haul larger cargo etc. while leaving the tailgate or cargo door open. 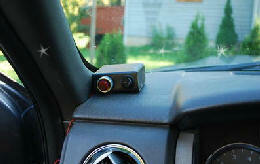 A great way to reduce the loss of cargo from the vehicle, use the Indicator Light. Get yours today! Only $25.00 CAD + taxes. 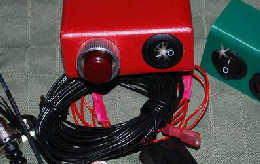 The Indicator Buzzer Light is a product that informs the vehicle operator that the tailgate or cargo door is open. The dash mount can be placed virtually anywhere in the cab but best placed in a location so that the driver can see and/or hear it. The unit has a buzzer and a light in a dash mount that comes on if the tailgate or cargo door is open. Once closed the buzzer and light goes off. The unit also has an option to turn it off if the operator so wishes, as to haul larger cargo etc. while leaving the tailgate or cargo door open. These products could prevent loss of cargo due to theft or the cargo falling out/off the vehicle. Thus reducing accidents, insurance claims, etc. The Load Support is used on flatbed trailers to haul such items as steel pipe, large tanks, machinery, etc.